Living all year in the area we can scout for your perfect venue, whatever the occasion, Below are just a few ideas for inspiration. Bustling town with miles of sandy beaches and plenty to do for guests of all ages. 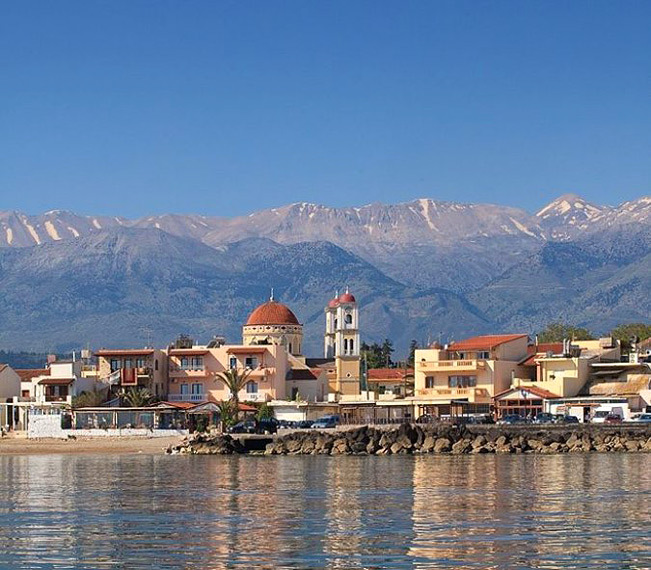 Explore Chania (30 minutes) or Rethymno (45 minutes) by bus, or stay local trying the many family run tavernas and cafés. Our selection of venues and accommodation are in walking distance of eachother or easy transfer. Hidden behind stone wall ruins, your guests enjoy a truly 'wow' factor when they step through to a lush green lawn to the golden beach with turquoise blue seas ahead. Seated under a covered terrace right on the beach, the hosts provide a delicious BBQ feast before your choice of evening entertainment. As well as intimate events this can cater for larger parties and offers a lovely venue for cooler weather too. If you want the charm of Crete but with 5 star service, this is perhaps the best boutique hotel, in the village. Book all 23 rooms for you and your guests, and enjoy a totally pampered experience with complete privacy and personal attention. The golden sandy beach infront of the hotel is quiet, the perfect place for your celebration. The meal takes place at the hotels own restaurant overlooking the sea, then dance under the stars by the pool bar until the sun comes up! May and October offer best prices and more availability. This venue is the only place to hold a full blown traditional Greek celebration! Built completely from local stones by the family, your entire event can be held under one roof: the estate has a family museum (ideal for the blessing), bar area (for cocktail hour), a traditional shepherd’s hut (chill out space or children's quiet area), huge covered dining area, dance floor, roof terrace (for fireworks), and even a small zoo! Very private, ideal for summer events and larger parties. Originally an ancient Manor House with stables, this family are restoring the building and offer to host special events including classical concerts in the grounds. With acres of rolling lawns down to the river, its own little chapel, surrounded by trees and framed by the White Mountains, there is no more refined setting for an elegant occasion, most popular with Cretans from the cities. A blank canvas, this venue is designed completely around you. Total privacy, perfect for fund raisers, concerts, a summer fete or catered party. A magical glade, cool and shaded by deep foliage in the height of summer, scented by the surrounding orange groves, only the sound of the clear mountain waters running to the sea. A very intimate, romantic venue. Away from the heat and crowds enjoy an intimate picnic, small parties or a romantic spot for a proposal……. This small friendly fishing village is ideal for families with its shallow sandy bays and family run businesses. Framed by the White mountains, silver green olive groves, blue Mediterranean sea and Karga island bird sanctuary -the beauty combined with the warm welcome have visitors returning again and again. Set on the hilltop overlooking Almyrida Bay, this incredibly romantic setting where sea meets sky gives a very personal touch to your ceremony and a feeling of floating in the air. Then, Cretan style, your party walk through the village collecting warm good wishes, to dine at your choice of taverna, where you can sample traditional dishes including oven roasted lamb or fresh grilled fish. Finish the night with a live band, Greek dancers or dance the night away on the beach with a DJ. On top of the most prestigious hotel in the area, this stunning roof top venue with spectacular views of the sea, villages & mountains and breathtaking sunsets offers modern glamour with a warm professional 5 star service, and can be used for the total celebration, from ceremony to after party. The limited number of private events allowed here make this a very exclusive venue. Accessible by a spectacular serpentine road through a rocky hillside or by sea (private boat transfers) this hidden bay has the ‘wow’ factor when you suddenly see the breathtaking turquoise waters. The waterside taverna is well known for its fish dishes. Set on 12km of wide golden beaches, this family owned venue provides everything for your special occasion. With a spacious covered restaurant and large outdoor bbq for dining, the charming decked beach bar for cocktails and dancing, then of course the beach directly in front, leading down to the clear blue Aegean Sea. Perfect for a complete beach celebration. This beautiful taverna in the heart of a sleepy village is well renowned for its food and warm hospitality, and caters for up to120 guests seated Greek feast style. Set in the lush hidden court yard garden with vibrant flora, under shady mulberry trees, step back in time and enjoy dish after dish of local specialities, before Greek dancing and drinking of raki take you well into the early hours! High on the hillside of the magnificent Cape Drapanos, the views out across the Bay and villages are breathtaking, the spectacular sunsets to rival those of fabled Santorini. Designed as a small village, why not hire all 9 of the villas and have your ceremony at the pretty white church, your after party a few steps away at the attached taverna, and end the night dancing under a blanket of stars, and walk a few steps home to the villas below. Perfect for family and friends coming together to celebrate, picturesque and private. A choice of yachts moored in Chania harbour, charter the smaller one for up to12 people for a special occasion, sail out to sea for sunset drinks and a 3 course dinner with fabulous views of the harbour at night. Why not sail across to Santorini or Athens in style, spend a day visiting Balos Beach or Elafonissi, how about an airport transfer to Heraklion by sea? Or for a really unforgettable celebration why not host a wedding or party at sea on the larger yacht, for up to 40 people? Surprisingly affordable and flexible options for a truly memorable celebration. We have a selection of private properties in many different locations and styles available for a wedding or private party. From renovated houses with courtyard gardens and Turkish arches, to ultra modern properties with infinity pools and stunning views, whatever your style, by the sea, in the mountains, tucked away in the countryside, we can find the one to suit you.